A couple of weeks ago, I wrote a blog about tablecloths that had been hand-embroidered by members of my family. Following on from that, I'd love to share my latest piece of work with you. I'm so proud of it! Not embroidery this time, but a rug. My gran was a rug-maker. I don't mean by profession; I mean this was her chosen craft. You know how an avid knitter always has something on the go and is constantly producing jumpers and scarves and baby clothes. Well, Gran used to churn out rugs, cushions and – yes – carpets. When I was a little girl, she lived with us for a few years and to repay my parents for their hospitality, she made a carpet for the living room. I can remember her sitting forwards in an armchair with the canvas over her knees, hooking away. She made the carpet in sections, which were sewn together at the end, including pieces for the alcoves. Not just a carpet, but a fitted carpet! I also remember the day – it was a Saturday – when the carpet was laid, though all I really recall is that while the grown-ups were busy doing all the hard work, my brother and I were bouncing round the room, singing Three Wheels On My Wagon. 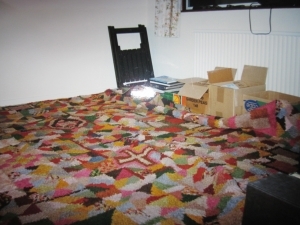 These days, none of Gran's carpets are around. They wore out and were replaced. I remember my mum, after many years, finally giving in and accepting that Gran's beautiful handiwork really did have to give way to a new carpet. 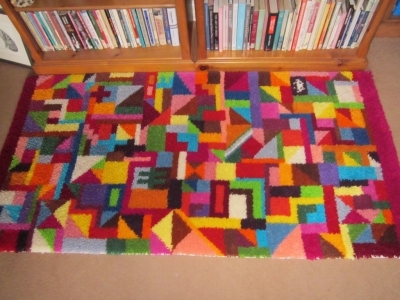 Here is a photo of another of Gran's carpets, which came to me second-hand. As far as I know, only two of Gran's pieces are still in existence and both now belong to me – a hearthrug and a cushion. This year, I decided to follow in Gran's footsteps and make a rug of my own. Gran's personal style was to mix together geometrical shapes in a mishmash so there was no pattern to follow. The only rule she had was that the wools must be separated out carefully at the start, so that the colours would be spread evenly across the design. So that's what I did and here is the result. It measures 6 feet by 4 feet. The canvas and wools came from Iriss of Penzance, whose mail order service is excellent. Thanks, Iriss! I'm so proud of my rug. Honestly, my head is so swollen that at this point, I'm having to pin my ears back to get through doorways; and my pride doesn't stem just from having made something so gorgeous and, let's face it, so big(! ), it also comes from feeling a link with Gran. - Why did it take me so long to think of making one? - If a 6x4 rug takes 4 months, then it really wouldn't take all that much longer to make a carpet... would it?? How beautiful. It reminded me of an amazing Joseph's technicolour dreamcoat. It's no surprise that you are proud - and you should be. Many congratulations.